One of Cardinal Sarto’s (the future Pope Pius X) most important duties as Patriach of Venice, and one that he placed high priority on was the pastoral visitation, whereby he traveled from parish to parish, assessing the spiritual needs of both clergy and laity alike. Hear these words, given to his faithful, in 1895. They could be spoken of with just as much truth today. 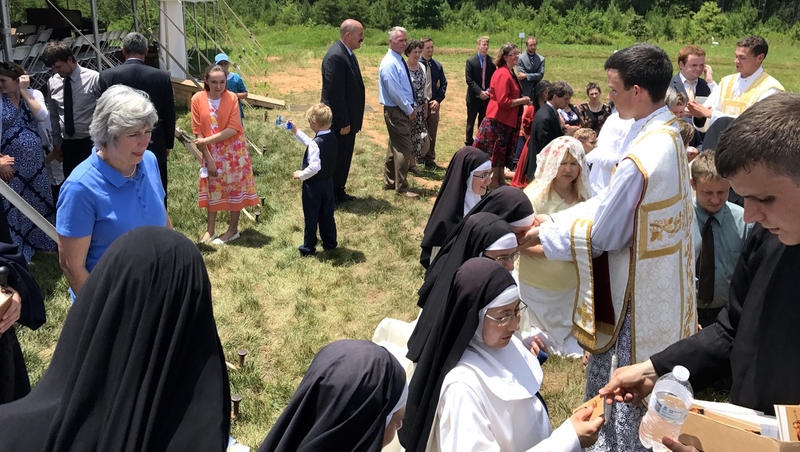 This entry was posted in Church crisis, Pope St. Pius X, Uncategorized and tagged Crisis in the Church, Pope St. Pius X on July 30, 2017 by damselofthefaith. How nice it sounds, “St. Joan of Arc.” But through all the history of sanctity you will find this same quality persisting—the quality of realizing that what we see and touch and feel are transitory things and unreal, and that the solid and substantial things, are the things that appear not, the world we only grasp by faith. And I am insisting on that particular quality this morning because I think it is one that stands out with quite extraordinary clearness in St. Joan’s life: she did really live for a promise, and we know that the promise came true, but she did not—not in this life. She was very young, you know. Did you realize that she was less than twenty years old when she was burnt at the stake? It is not true that she dressed as a man: she dressed as a boy. 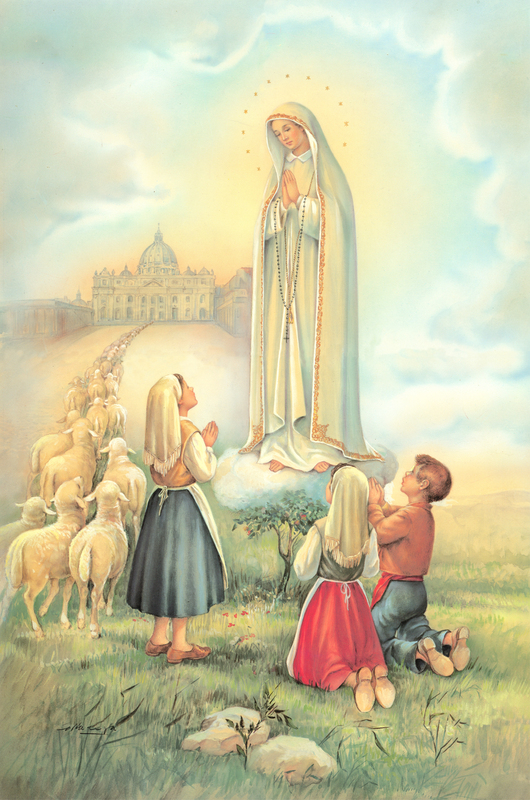 When she was only thirteen years old, at the age when other boys and girls were fidgeting and playing the fool during Mass, as people did in those days, she could hardly go out of doors without hearing the voices of saints and angels talking to her. And those voices dominated her life; they echoed so loudly in her ears that all the world’s noises were drowned for her. People said: “It is very silly of a small girl like you to think she can go and see the King”—she did not hear them. And the King, as you well know, disguised himself and hid among his courtiers, and she went straight up to him: “But I am not the King,” he said; “that is the King over there.” “Oh, yes, you are; I have come to raise the siege of Orleans and crown you King at Rheims.” It was no good; the voices had told her about it. And I suppose when she had been appointed Chief of the Army, the General Staff would always be raising military difficulties about re-entrant angles and being enfiladed by arquebus-fire, and so on, but it did not make a bit of difference to her, she always did what the voices told her—they were close to her ear, you see, and the criticisms of the General Staff were only a distant echo. She went out, not knowing whither she went. And of course she had disappointments. After the first few victories, after the crowning of the King, the people she had come to save contented themselves with a partial conquest, and hung about making treaties and demobilizing troops. And truly, if she had been mindful of that from whence she came out, she had doubtless time to return; she could have gone back to Domremy and rested on her laurels. But the ingratitude and apathy of the court affected her no more than its honours had done; she simply went on obeying the voice. And the French lords played her false, and she was taken prisoner. But she endured, as seeing him who is invisible. And then came the hardest time of all. I do not think she minded being in prison; I do not think she minded the threat of execution; that was not why she tried to escape. No, it was simply that it seemed quite obvious to her she was to deliver France—the voices had told her so—and France was not yet delivered. And so she went to the stake, her hopes still unfulfilled, but never doubting for an instant that the voices were true. Five years later the King entered Paris; twenty-two years later, England had no possessions left on French soil. She believed that he was faithful who had promised, not having received the promises, but beholding them afar off and saluting them. She could not foresee that her unjust condemnation would be reversed, point by point, twenty-five years after her death: she could not foresee that, nearly five hundred years after her death, France, once more liberated, would receive the tiding of her canonization by the tribunal to which, in life, she never ceased to appeal, the tribunal of the Holy See. But she believed that he was faithful who had promised. 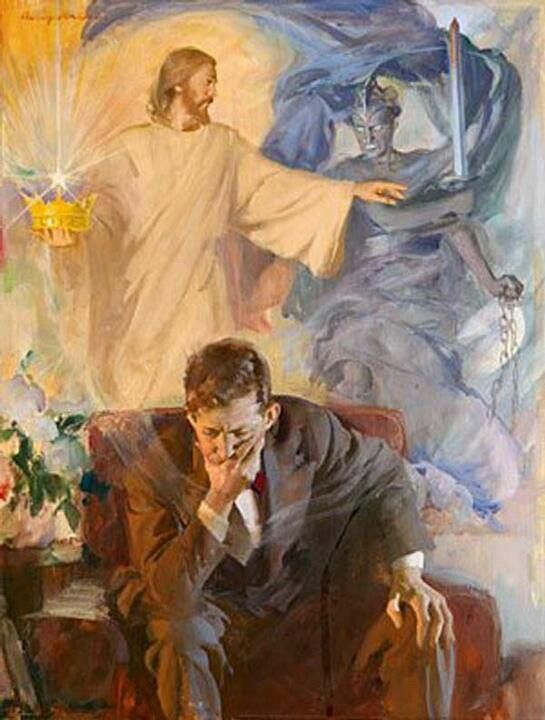 That, then, is her great witness, as is the witness of all the saints: that is her capital contribution to our Christian hope—we know, because the saints have told us so, that it is the things of this world that are shams and shadows, and the real things and the solid things are the things we cannot see. Our Saviour Christ has ascended up into heaven, and a cloud received Him from our sight, but we are not therefore to think of the spiritual world as something far removed from us, only to be reached by a supreme effort of thought. On the contrary, the spiritual world is all about us: the voices are still there, only St. Joan could hear them and we cannot. I wonder whose fault that is? Blessed are the pure in heart, for they shall see God. This entry was posted in Faith, St. Joan of Arc and tagged St. Joan of Arc on July 28, 2017 by damselofthefaith. 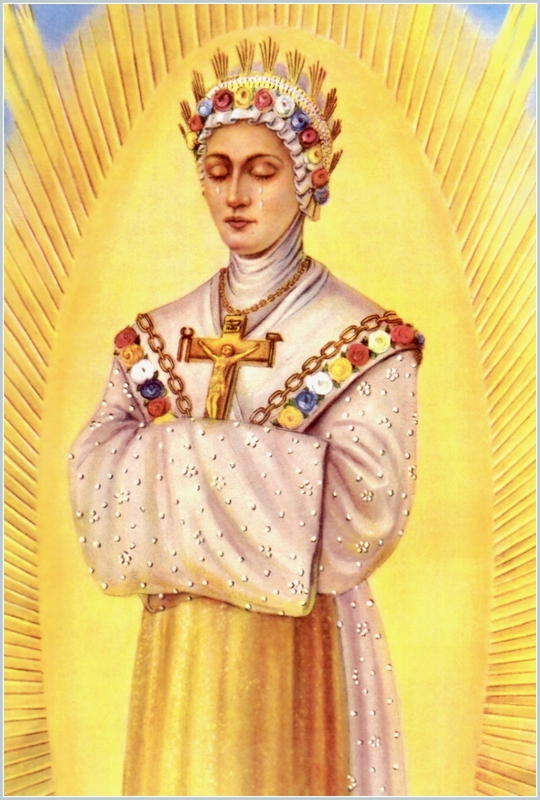 Most don’t know the Italian noblewoman, Princess Elvina Pallavicini, accepted Archbishop Lefebvre into her palace for a conference, showing him and ultimately the Traditional Faith her support, when few in the Church would even stop to listen to anything Archbishop Lefebvre had to say about the Faith that sanctified the Church for 2,000 years. She was threatened with excommunication for even entertaining the Archbishop. However, fidelity is victorious in the end and the palace of the Princess became a focal points for many priests, bishops and cardinals. Indeed, the Princess was right: there is no room in the Church for the cowardly. Forty years ago a historical event took place: Archbishop Marcel Lefebvre held a conference on June 6th 1977 at the Pallavicini Palace in Rome, on the subject “The Church after the Council”. I think it is worthwhile to recall that event, on the basis of notes and documents I have kept. 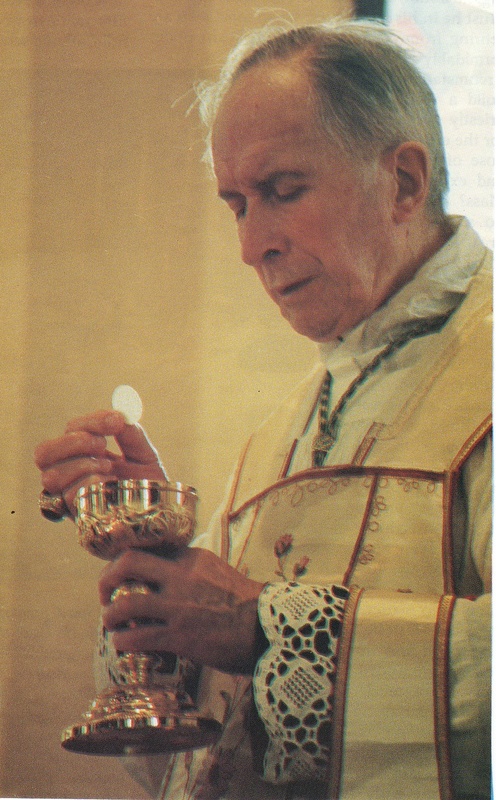 Archbishop Marcel Lefebvre, founder of the Priestly Fraternity of St. Pius X (1970), after the priestly ordinations of June 29th 1976, was suspended a divinis on July 22nd of the same year. Informed Catholics however, had serious doubts as to the canonical legitimacy of these measures and in particular, incomprehension with regard to the behavior of Paul VI who seemed to reserve his censorships for only those who said they wanted to remain faithful to Church Tradition. 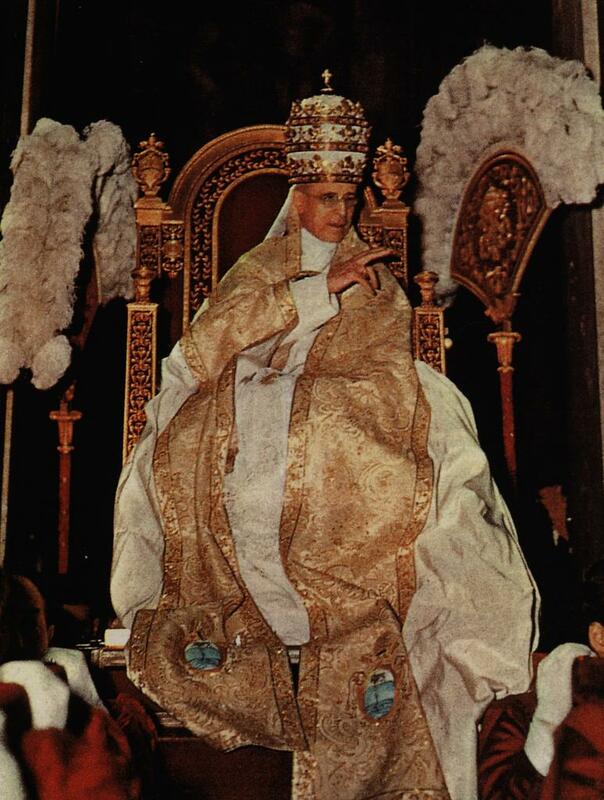 In this climate of disorientation, in April of 1977, Princess Elvina Pallavicini (1914 -2004) decided to invite Archbishop Lefebvre to her palace in the Quirinal, to hear his reasoning. Princess Pallavicini was 63 years old at the time and the widow of Prince Guglielmo Pallavicini who had been killed on his first war mission in 1940. For many years she had been in a wheelchair as a result of progressive paralysis, but she was a woman of indomitable spirit. She had a close group of friends and advisors around her, among whom were Marquis Roberto Malvezzi Campeggi (1907-1979), Colonel of the Papal Noble Guard at the time of the corps’ dissolution in 1970, and Marquis Luigi Coda Nunziante di San Ferdinando (1930-2015), former Commander of the Italian Navy. Initially, news of the conference circulating during the month of May did not stir up any concern from the Vatican. Paul VI thought it would have been easy to convince the Princess to desist from her idea and entrusted the task to one of his closest collaborators, “Don Sergio” Pignedoli (1910-1980) whom he had made a cardinal in 1973. 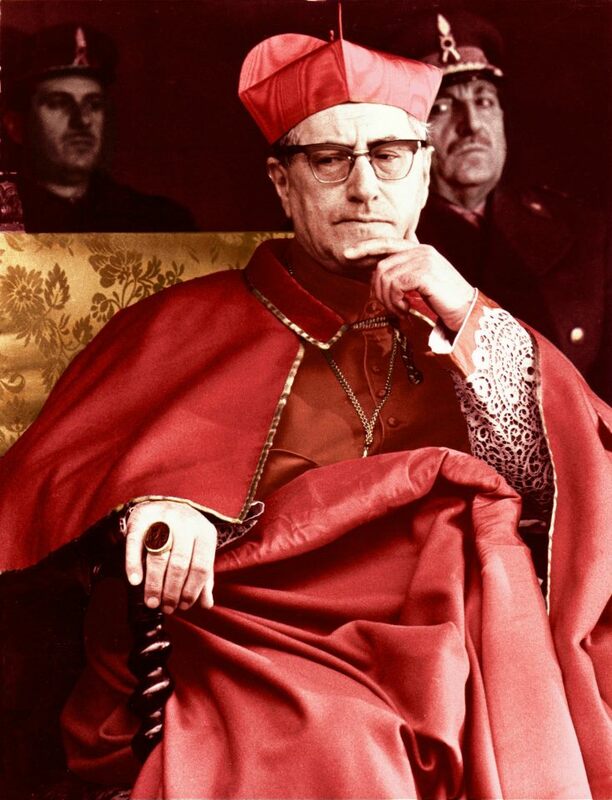 Faced with this unexpected resistance, the Vatican turned to Prince Aspreno Colonna (1916-1987), who still occupied, ad personam, the office of Assistant to the Papal Throne. When the head of this historic household asked to be received, the Princess told him she was busy. Prince Colonna asked to visit the next day at the same time, but the noblewoman’s reply was the same. While the Prince withdrew quietly, the Secretary of State thought of getting through in another way. Archbishop Andrea Lanza Cordero di Montezemolo, who had just been consecrated Archbishop and named Nuncio to Papua-New Guinea, asked for an audience with the Princess. The prelate was the son of Colonel Giuseppe Cordero Lanza di Montezemolo (1901-1944), head of the Monarchic Resistance in Rome and shot by the Germans at the Fosse Ardeatine. During the German occupation, the young Princess Elvina had collaborated with him, meriting a bronze medal of honor. I also took part in the meeting, but my presence really irritated the future cardinal, who, in vain, appealed to the memory of his father to avert the upcoming conference. The Nuncio was told that it was the same resistance of many soldiers to National Socialism, and how it was necessary at times, to disobey unjust orders from superiors in order to respect the dictates of one’s conscience. At this point the Secretary of State played his last card, by turning to the King of Italy, Umberto II, in exile in Cascais. Marquis Falcone Lucifero, Minister of the Royal Household, telephoned the Princess to let her know that the Sovereign had strongly urged her to postpone the conference. “I’m astonished at how His Majesty allows himself to be intimidated by the Secretary of State, after everything the Vatican did to the monarchy”, she replied decisively, confirming that the conference would be duly held on the date established. Marquis Lucifero, being the elderly gentleman he was, sent the Princess a bouquet of roses. At this point the Vatican decided to use tougher tactics. A real campaign of psychological terrorism then began in the major daily newspapers presenting the Princess as an obstinate aristocrat, surrounded by a handful of “nostalgics” in a world destined to disappear. In private, it was made known to Donna Elvina that, if the conference was to take place, she would be excommunicated. On May 31st, on the front page of the daily newspaper “Il Tempo”, a declaration from Prince Aspreno Colonna appeared where we read “The Roman Patriciate dissociates itself from the initiative”, deploring it as “completely inopportune”. The bombshell was dropped however, on June 5th by the Cardinal Vicar of Rome, Ugo Poletti (1914-1997). With an aggressive statement in the Italian Bishops’ daily newspaper Avvenire, Poletti attacked Archbishop Lefebvre and ” his aberrant followers”, defining them as “a handful of class nostalgics, prisoners of traditional habits”. 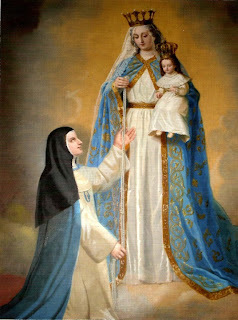 He further expressed, “astonishment, pain and sorrow, but the firmest disapproval for the offence made against the Faith, the Catholic Church and Her Divine Head, Jesus”, Archbishop Lefebvre having placed in doubt “fundamental truths of the kind relating to the infallibility of the Catholic Church founded on Peter and his successors, in matters of doctrine and morals”. Finally the fateful day of June 6th arrived. The conference was carefully reserved for four hundred invited guests, controlled by “private security” provided by the “Alleanza Cattolica” youth, but there were more than a thousand who filled up the staircases and the garden of the historical Rospigliosi-Pallavicini Palace, famous all over the world for its works of art. Archbishop Lefebvre arrived accompanied by his young representative in Rome, Don Emanuele du Chalard. Princess Pallavicini went to meet him in her wheelchair, pushed by her Lady-in Waiting, Donna Elika Del Drago. 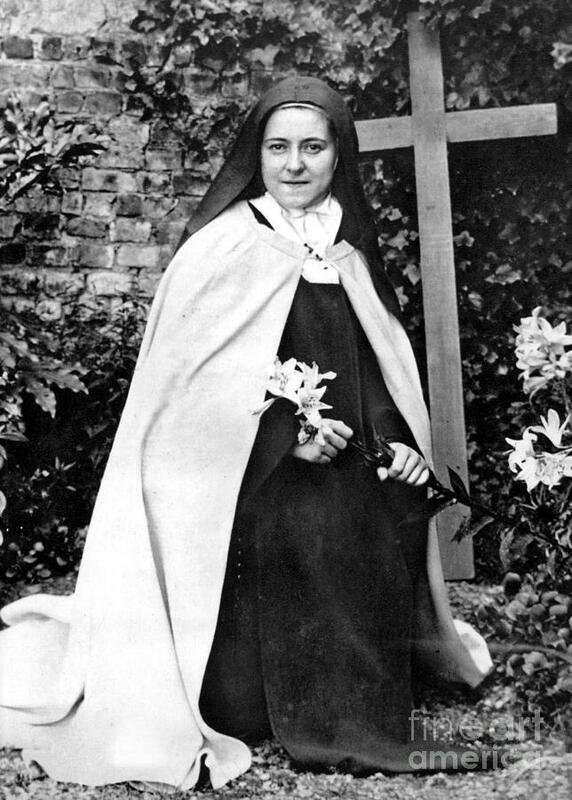 Princess Virginia Ruspoli, widow of Marescotti, one of the two hero-princes at the Battle of El Alamein, gave Archbishop Lefebvre a relic of St. Pius X which had been given to her personally by Pius XII. 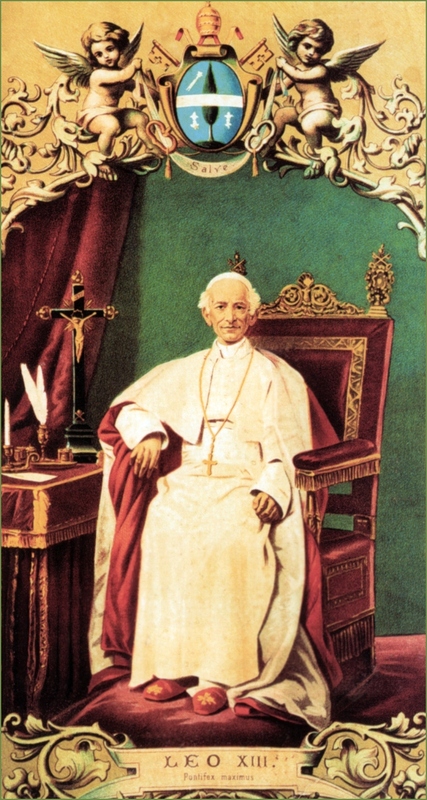 Despite [the fact] that the Grand Priory of the Order of Malta in Rome had expressed “a binding necessity” to abstain from intervening at the conference, Prince Sforza Ruspoli, Count Fabrizio Sarazani and some other courageous aristocrats defied the censures of the institution and were there in the front row, right beside Monsignor François Ducaud Bourget (1897-1984), who had led the occupation of the Church Saint-Nicolas du Chardonnet in Paris on February 27th. Princess Pallavicini introduced Archbishop Lefebvre and he took his place under the red baldachin with the coat of Arms of Pope Clement IX, Rospigliosi. The Archbishop after some moments of prayer, began with these words: “I respect the Holy See. I respect Rome. If I am here it is because I love this Catholic Rome.” The Catholic Rome that he had before him interrupted his speech repeatedly with thunderous applause. The hall was filled to overflowing and a crowd had gathered on the great staircases of the palace. The “Council of aggiornamento” – explained Archbishop Lefebvre – in reality wants a new definition of the Church. To be “open” and be in communion with all religions, all ideologies, all cultures, the Church should change its excessively hierarchal institutions and break up into many National Episcopal Conferences. The sacraments will insist on initiation and the collective life, more than the driving out of Satan and sin. The leit-motiv of change will be ecumenism. The practice of the missionary spirit will disappear. The principle that “every man is Christian and doesn’t know it” will be proclaimed, so it doesn’t matter whatever confession is practiced – it is seeking salvation. 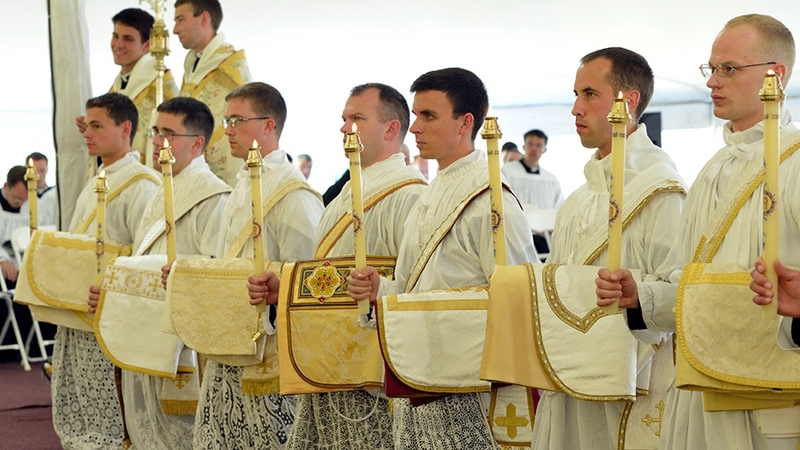 The liturgical and ecumenical changes – continued Archbishop Lefebvre in the hushed silence of all those present – cause the disappearance of religious vocations and make for deserted seminaries. The principle of “religious liberty” sounds outrageous to the Church and Our Lord Jesus Christ, as it is nothing other than “the right to public confession of a false religion with no interference from any human authority”. Archbishop Lefebvre then lingered for a bit on the post-council’s caving-in to Communism, referring to the repeated audiences given to Communist leaders by the Holy See; the agreement not to condemn Communism during the Council; the contemptuous treatment reserved for more than 450 bishops who asked for this condemnation. On the contrary, dialogue with Communism was encouraged by nominating pro-Communist bishops like Monsignor Helder Camara in Brazil, Monsignor Silva Henriques in Chile, and Monsignor Mendez Arceo in Messico. The meeting ended with the singing of the Salve Regina. The conference was a strategic victory for those who were inappropriately called traditionalists, as Archbishop Lefebvre managed to make his theses known on the international level, without [suffering] canonical consequences. Paul VI died a year later, devastated by the death of his friend Aldo Moro. The name of Cardinal Poletti is still linked to the murky business of the nulla osta he granted on March 10th 1990, for the entombment of the Banda della Magliana Boss “Renatino” De Pedis, in the Basilica of Sant’Apollinare. Princess Pallavicini came out a winner from this “challenge”. Not only was she not excommunicated, but in the following years her palace became the point of reference for many cardinals, bishops and Catholic intellectuals. She and her Roman friends were not “phantoms from the past”, as the Corriere della Sera defined them on June 7th 1977, but witnesses to the Catholic Faith who were preparing the future. Forty years later, history has proven them right. 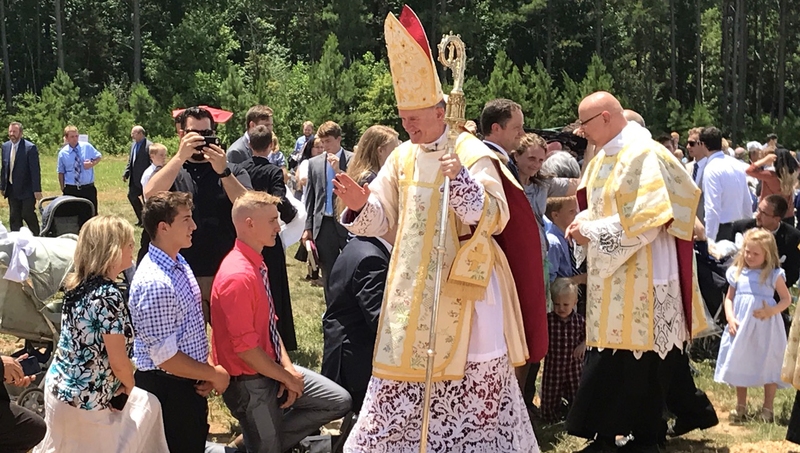 This entry was posted in Archbishop Lefebvre, Church crisis, SSPX, Uncategorized and tagged Archbishop Lefebvre, Crisis in the Church, SSPX on July 26, 2017 by damselofthefaith. 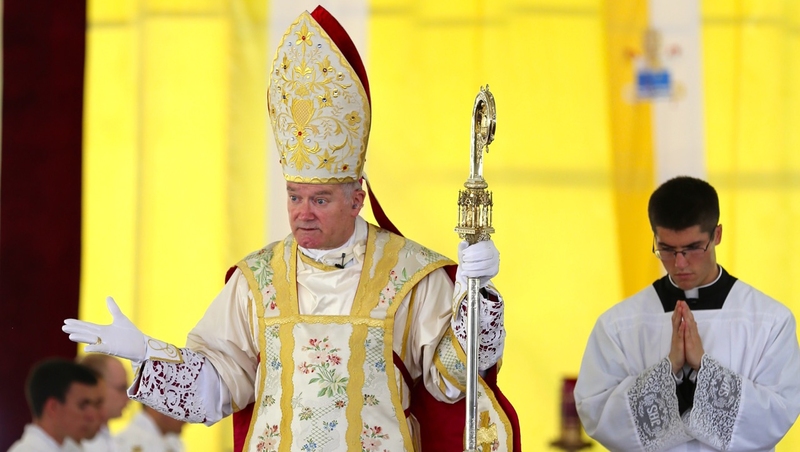 Bishop Fellay gives a thought provoking and beautiful sermon at the first Mass of Fr. Ian Palco, a newly ordaimed priest, on the importance of the Priesthood in relation to the Mass, the meaning of the Mass and why it’s important for us to have a great love for the Mass, the atonement which the priest makes to God on our behalf for the sins of mankind. There are four traditional ends of the Mass: adoration, atonement, thanksgiving and petition. Read the summary provided by the Society and better yet, listen to the calming voice of the good Bishop expound upon these points and preach the doctrine of the Church. 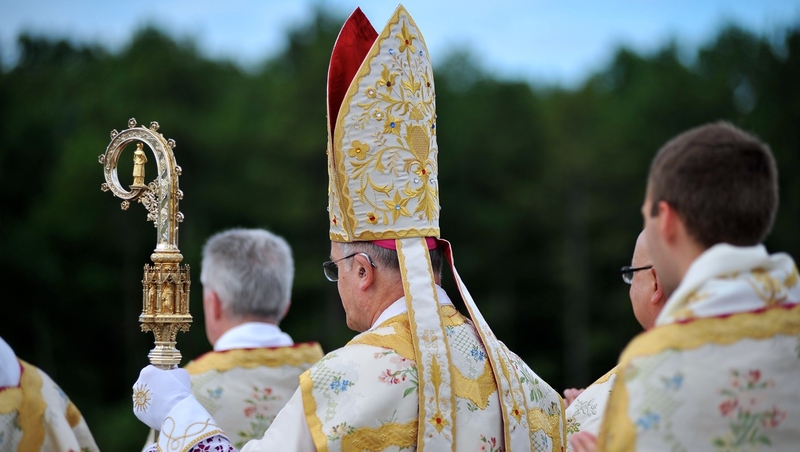 Bishop Fellay preached at the first Mass of Fr. Ian Palco, explaining the dignity of the priest and the mystery and value of the Mass. The Lord expects from his priests a love that is infinite, ever-growing, and unlimited: not a mere human love. 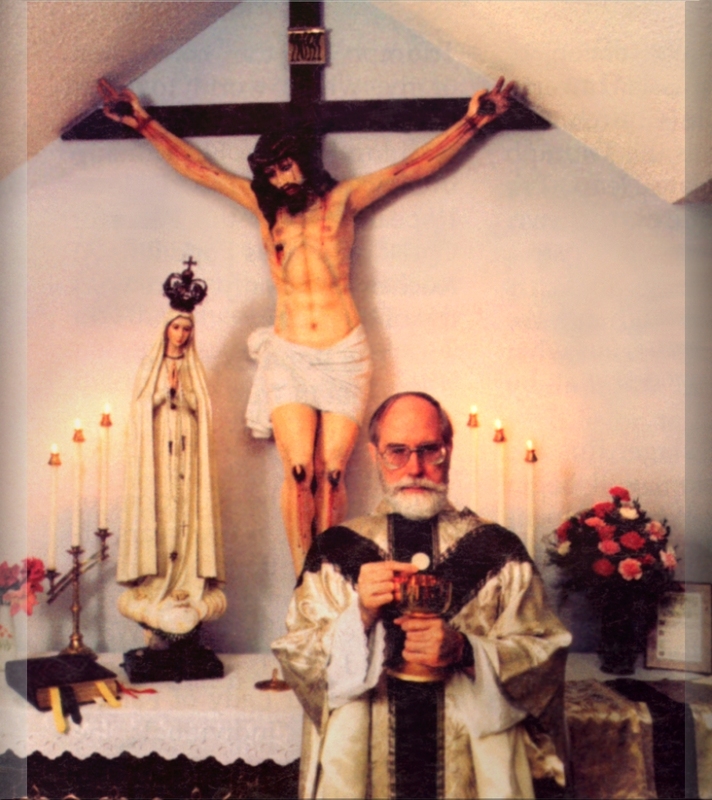 Christ wants the priest to adore God in a perfect way, to give thanks to God at all times, to make reparation for the sins man has committed, and to intercede for mankind in all their intentions. 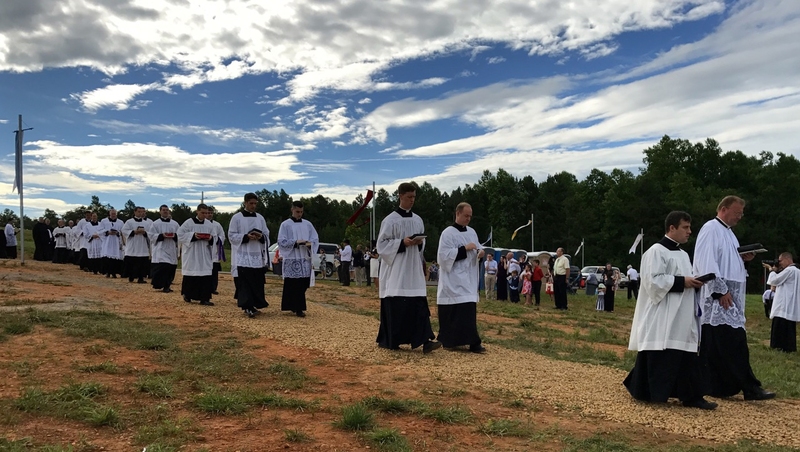 This sermon was delivered on Saturday, July 8, 2017, the day after the priestly ordinations at the new seminary in Dillwyn, VA. The main points of His Excellency’s sermon are provided below – the video provides audio of his sermon explaining the four ends of the Mass. The act of adoration means that man recognizes the authority of God and that he freely accepts the rights God has over man. But, all men being sinners, and their acts being limited by their senses, they cannot go beyond this world on their own. Incapable of exceeding the sphere of the simply natural and to reach out to the infinite, man, by himself, cannot offer to God due adoration. Only Jesus Christ, being the Son of God, makes us understand the narrowness of human life. 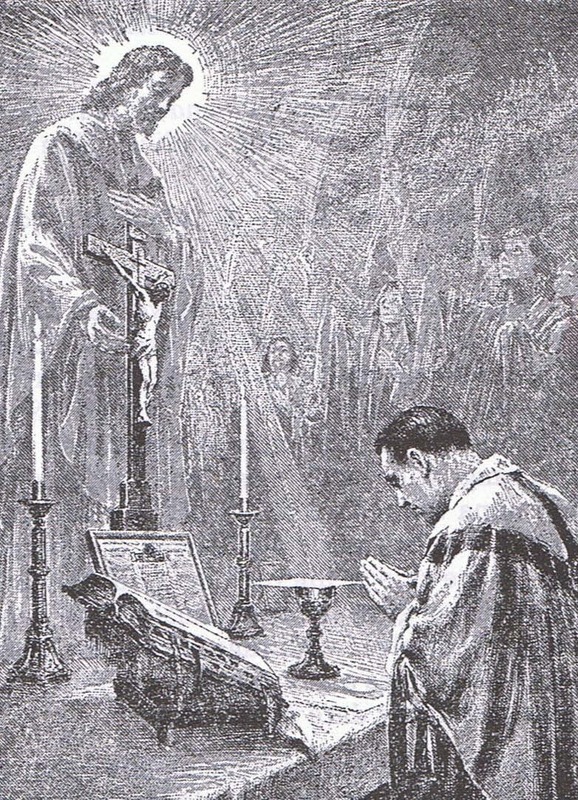 He offers himself in the Holy Mass and, through the priest, we can offer to God adoration that is fully acceptable to Him. Many times in life, man rejoices at important gifts which he is never able to give back in full: what we have received from our parents, our country, and God is invaluable. We are never truly able to thank our parents and adequately express what we owe them. It is the same with God. We owe him our life! He cares about us unceasingly, He gave His Son, and offered us the possibility of becoming His sons. Never could we thank God as we should if it was not for the Holy Mass. 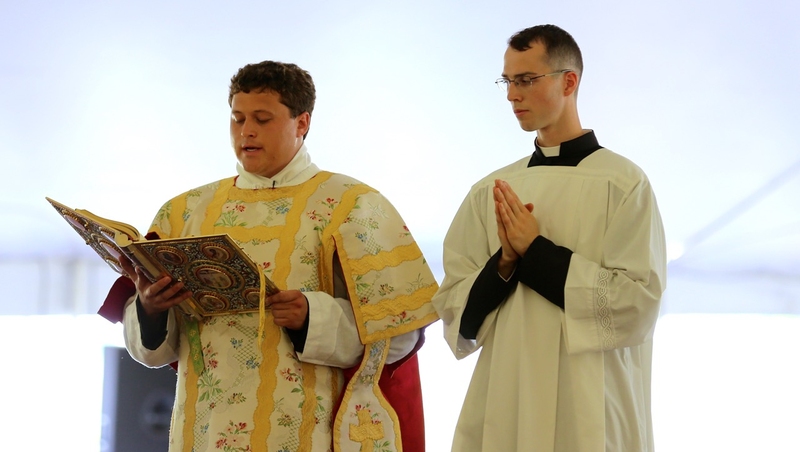 Being elevated to God’s instrument, the priest offering Mass can say thanks to God the way God desserves to be thanked. The sacrifice the priest offers at the altar — “my sacrifice and your sacrifice” — “the sacrifice of the priest and the sacrifice of the faithful” (Offertory), united with the sacrifice of Christ, becomes a sacrifice with an infinite dimension, impossible to be understood by man, a sacrifice that is pleasing to God. The satisfaction that one Holy Mass gives to God, being an act of Christ, is sufficient to make reparation for all the sins of humanity. But this satisfaction must be allocated to man. The Holy Mass is the source of all graces that can easily fill a man’s heart. But the amount of graces to be received, and the forgiveness given to man, depends on how open he is to the action of grace. The more man is prepared to receive the graces, the more man will receive. The Prayer of Our Lord during the Holy Mass is infinite and infallible. Again, since man prays with Our Lord, since he has a part in this prayer, the act by itself and the fruits coming from it, is tainted by the imperfection of man. If we had the faith and we knew the plan of God, there would be no unanswered prayer. The most efficient prayer we can ever present to God happens at Mass, thanks to and through the priest. 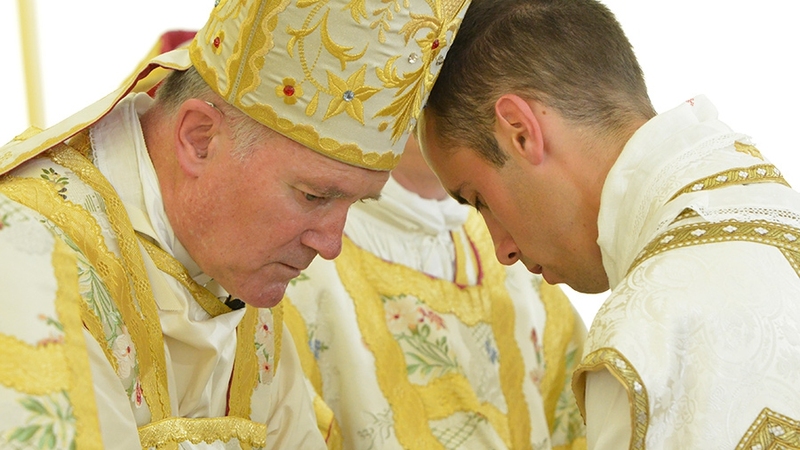 Archbishop Marcel Lefebvre called prayer the essential apostolate of the priest. 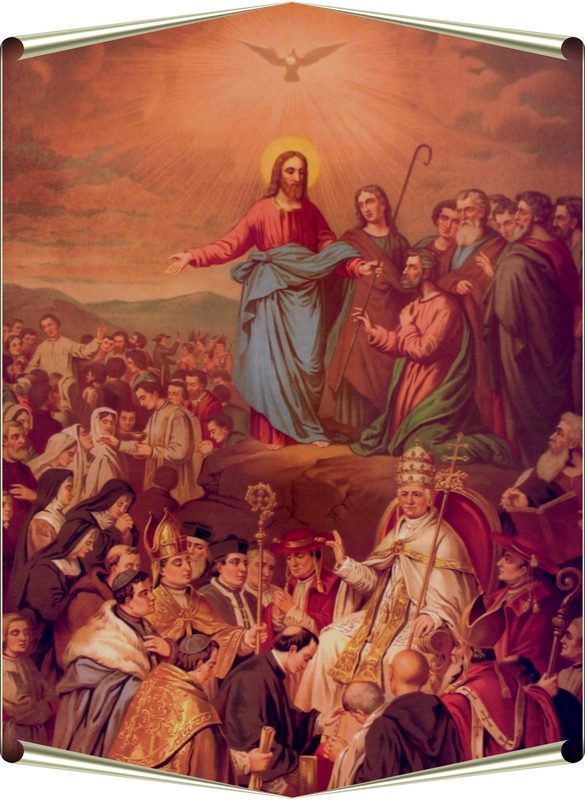 Any apostolate aims to bring his people closer to God, to help them avoid sin, and to make them progress in virtue. None of this can happen without the graces of the Mass. The graces of Christ in the Mass are universal and know no borders or limitations. Even the angels have less power than the priest! 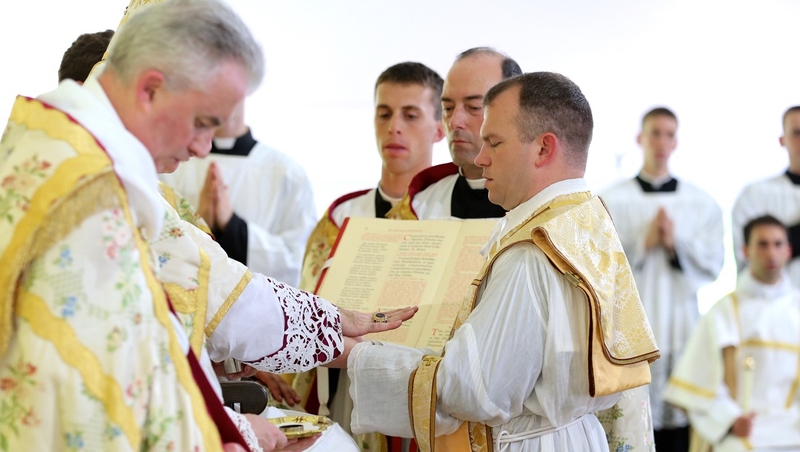 Celebrating Mass means is the essence of the priesthood. How Does God Expect the Priest to Help the Faithful? There is a short prayer in the breviary: “Fac ut sim sacerdos secundum Cor tuum.” “Make my heart like unto your heart!” Jesus wants to be one with the priest and he wants the priest to be one with him. He wants to pour into the heart of the priest the love of God and, through the heart of the priest, he wants to approach the faithful. 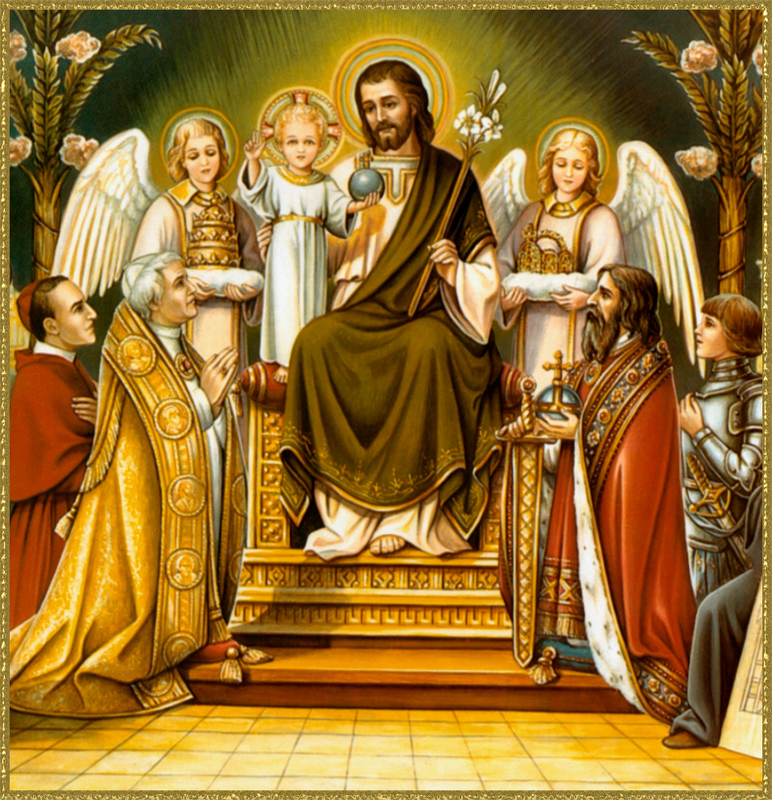 The priest should look at Christ at all times and ask: What do you want me to do? To say? The life of the priest is about the love of Christ and the love for the sheep he has entrusted to the priest. Human nature is such that man loves what he finds to be good. A priest, like Christ, who dies for all people, has to open his heart to all men and must be ready to die for the sinner. “We must love God with all our heart with all our strength.” There can not be any limitation to our love. This charity, the union we have now with God, is the same as the saints have for God in heaven. As long as we live on earth, our charity has to increase every moment. No man can say at any moment that he is loving God and his neighbor as much as he should. The progress souls make from one Communion to the next, following St. Thomas Aquinas, is exponential. Only God knows how much progress we make at every Communion, and what marvels God works in our soul. This entry was posted in Church crisis, Sermons, SSPX and tagged Catholic, Crisis in the Church, Sermons on July 22, 2017 by damselofthefaith. From June 6-9, representatives of the Russian Greek Catholic Church (RGCC) met for a historic congress in San Felice del Benaco. One of the aims of the congress was to request a bishop to lead its 30,000 members worldwide. 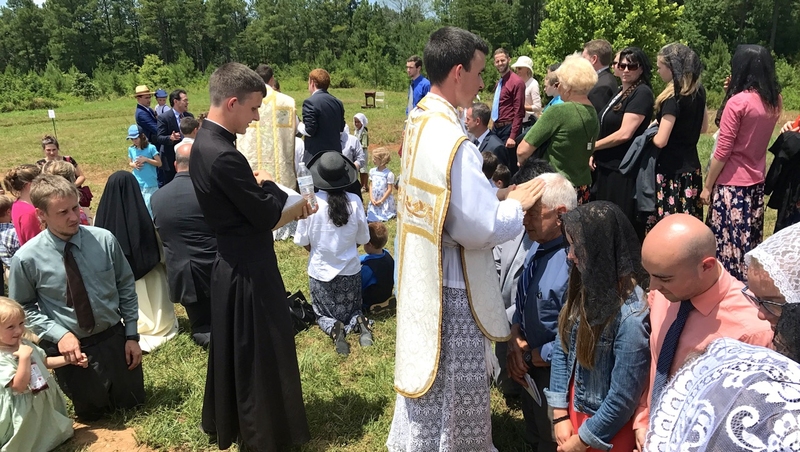 As the smallest of the sui iuris Eastern churches in communion with Rome, the RGCC’s faithful have been entrusted to the care of local Latin ordinaries rather than having their own specific hierarchy. While some Latin bishops have been supportive of the RGCC’s survival, others have been less so. If the RGCC is to have a future, both in its native Russia and in the diaspora, having its own hierarch is imperative. The history of the RGCC dates back to the late 19th century. Despite Greek Catholicism being illegal throughout the Russian Empire, individual Russian churchmen and intellectuals, including the eccentric and controversial Vladimir Soloviev, began pushing for Russian Orthodox Christians to unite themselves to Rome. Soloviev, for example, posited a novel theory that Rome and Moscow had never truly broken communion after the Great Schism (typically dated to 1054 A.D.). Following Tsar Nicholas II’s edict of religious toleration in 1905, it became possible for more Russian Orthodox to join the Catholic Church. 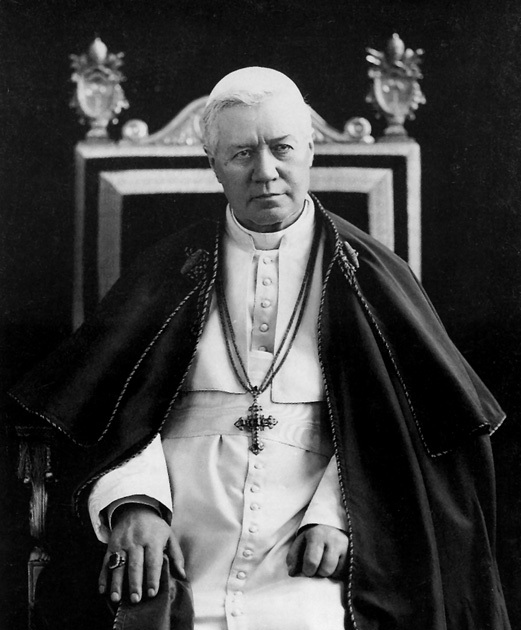 Eventually, in 1908, Pope St. Pius X, through the Vatican Secretary of State, decreed that the Russian Catholics should retain their liturgical and spiritual patrimony in full, without any alteration or admixture with another rite. What this meant is that Russian Catholic communities could use both the so-called Synodal form of the Byzantine Rite as had been approved for the Russian Orthodox Church by its leadership and the so-called Old Rite that had been suppressed violently in the mid-17th century. Those holding to the Old Rite, known as Old Believers, had been persecuted by the Russian state for centuries because they resisted reforms to the liturgy. Several Old Believer communities entered into communion with the Catholic Church during this period of time. Unfortunately, after the Soviet Revolution in 1917, the nascent RGCC found itself persecuted violently. While some RGCC communities managed to survive in the diaspora, as the decades moved on, little attention was given to the needs of the RGCC, partially as part of a larger policy of appeasement by the Vatican toward the Soviet Russian state. Even after 1989, the remnants of the RGCC in Russia found it difficult to gain support from the Vatican, leaving them to largely fend for themselves without much opportunity for growth. Although the Soviet state is no more, ecumenical concerns at the Vatican have continued to keep the RGCC marginalized. The present Russian Orthodox Church maintains the position that all Greek Catholics, including those living in Ukraine and Belarus, should return to the Orthodox fold. The Russian Orthodox Church has also been critical of any Catholic proselytism of Orthodox Christians and has pressured Vatican officials to curtail any expansion of Greek Catholicism into lands like Ukraine and Russia. For the Orthodox, Greek Catholicism is a threat to their ecclesiastical hegemony. Whether Rome follows through in supporting the resolutions and requests of the RGCC remains to be seen. In addition to asking for a bishop, the RGCC wishes for the process of Russian Orthodox entering the Catholic Church to be simplified, and for former Russian Orthodox becoming Catholic not to be absorbed automatically into the Latin Church. 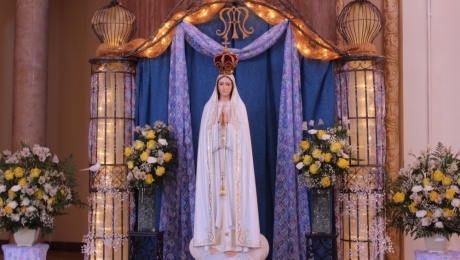 It is telling that the clergy meeting in June took the opportunity to consecrate the RGCC to Our Lady of Fatima, for it will only be by her prayers and protection that the RGCC will continue to thrive and survive. Prayers should also be offered that the RGCC will serve as a bridge to lead the Russian Orthodox back into communion with Rome. This entry was posted in Catholic, Russian Greek Catholics, Uncategorized and tagged Russian Greek Catholic Church on July 17, 2017 by damselofthefaith. 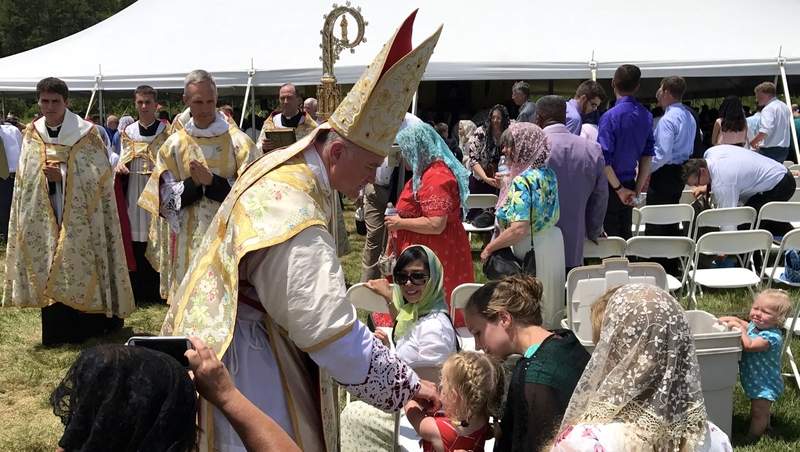 Bishop Bernard Fellay, Superior General of the SSPX, ordained 9 American Priests and 6 Deacons, on the morning of July 7th, Feast of the Sacred Heart of Jesus. 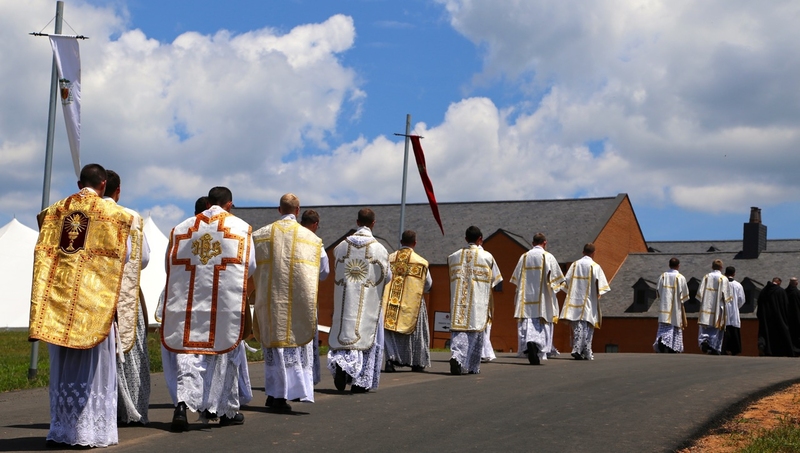 This was the first priestly ordination at the now completed St. Thomas Aquinas Seminary in Dillwyn, VA. 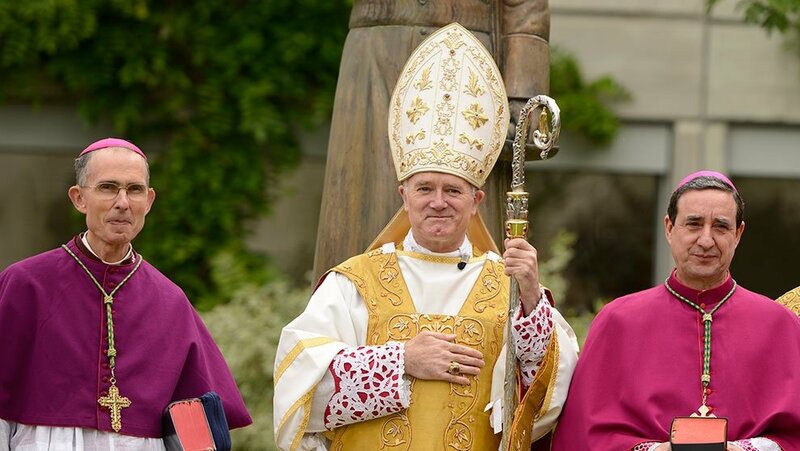 The following is a print summary of Bishop Fellay’s sermon, as of now. Pictures are to follow. 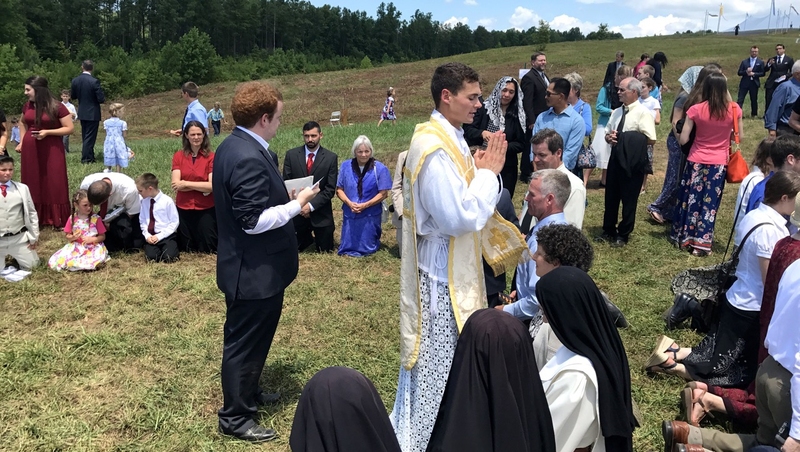 What a glorious day for the Church and the Society, more fruits of the Society’s labor of love – new priests to save souls and aid in the restoration of the Church. 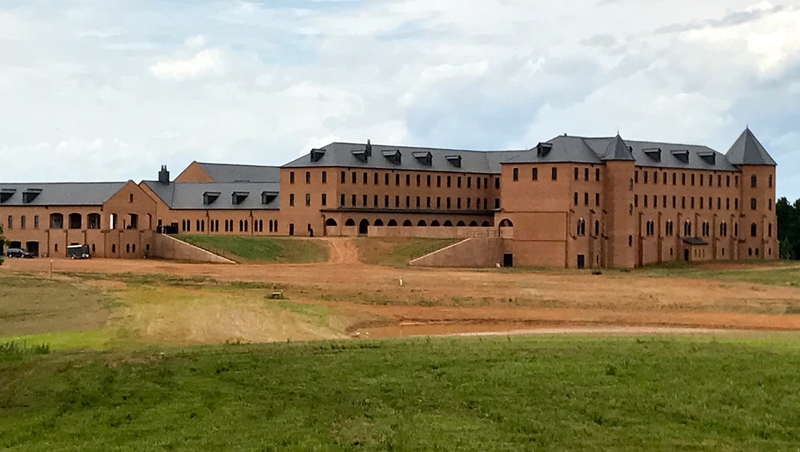 The new Seminary, built to literally represent a fortress, will house, God willing, many more generations of future Priests to come. The divine graces poured forth upon these men give them the supernatural power to save souls from hell and lead them to heaven. Congratulations to the newly ordained and may God reward them for their fidelity to His Church! 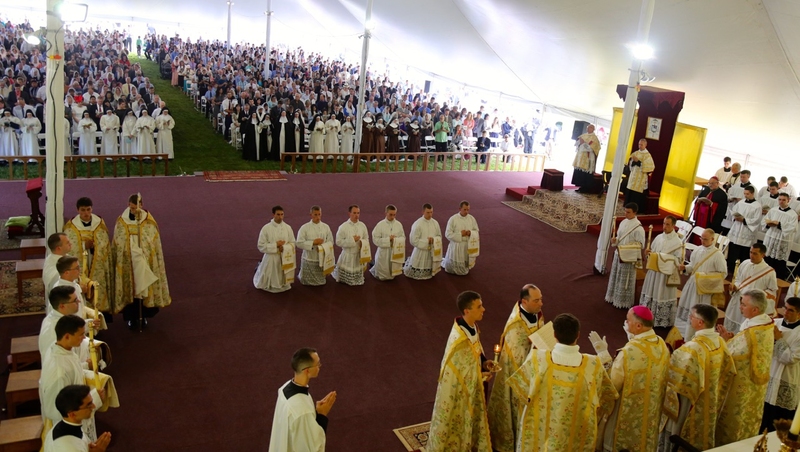 For the first time, these grounds see the tremendous happiness from Almighty God and Holy Mother Church for this harvest of deacons and priests. Who are they, these men? 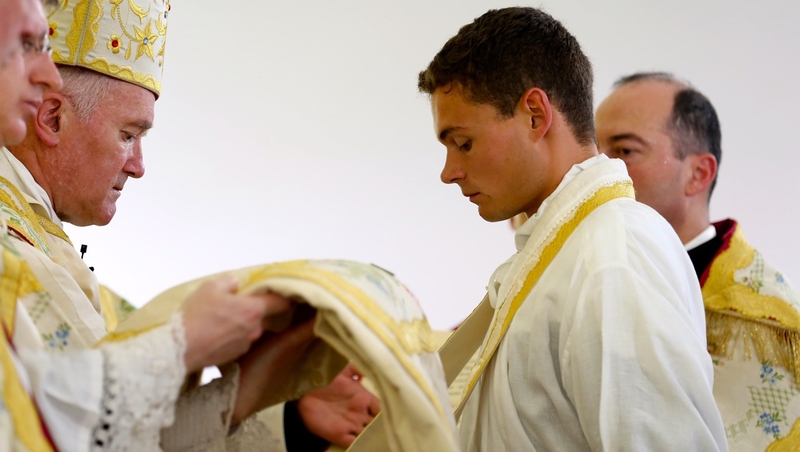 Holy Scripture says that a priest is a Man of God. He is not of this earth. 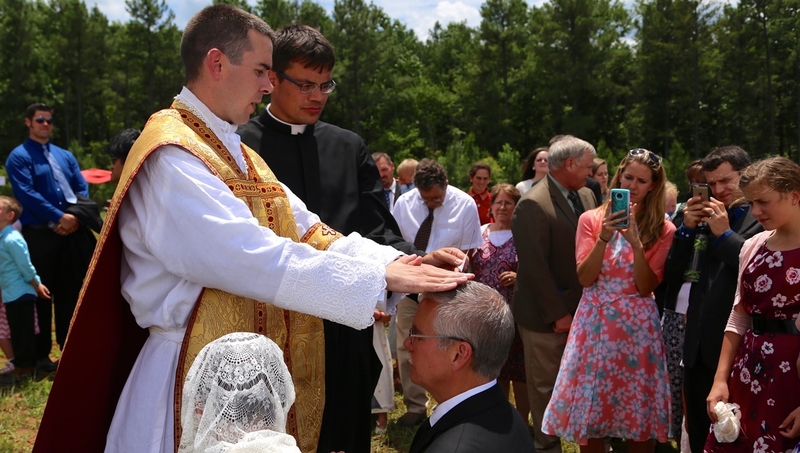 At his ordination, the priest receives something real in his soul. They are human beings, with a body and soul, with virtues and defects. What they receive today will help them, and it also changes them. Philosophically we say that when an accident is added it modifies their substance. It is like this with the man who is made a priest, but it also changes his character. 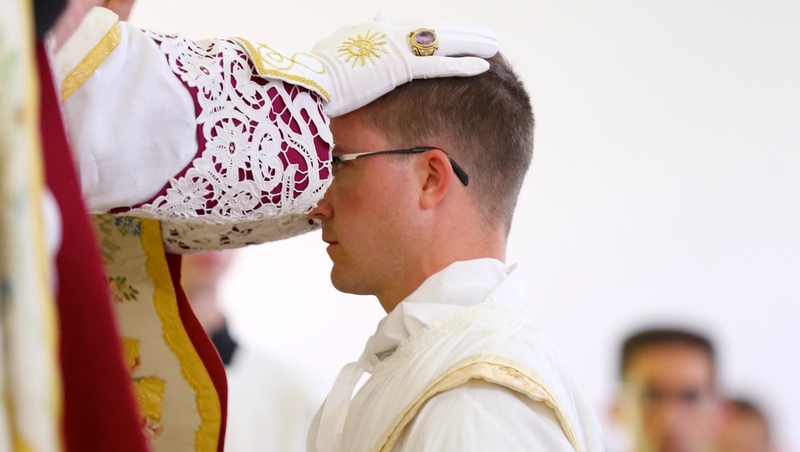 The sacrament of ordination goes deep into his soul, so deep that it cannot be erased – not by age, or death, or sin. The soul is forever changed. This Man of God is chosen by God. He is a prophet because it is his role to speak in the name of someone else. God has chosen these men to be his mouthpiece to the world. They are to remind creatures of God and God’s interests; these things are always to come first. God is their end and their fulfillment, His Ten Commandments, and His only begotten Son, Our Lord Jesus Christ. “God is talking to us creatures,” His Excellency continued. This Word has been entrusted to the Deacon. He receives the Gospel in the ordination ceremony. Each time the priest reads the Gospel at Mass, he kisses it. We might not understand the importance of communicating the Gospel, but the devil does. He makes it hard to spread the Gospel through fear of the might of the world. We must resist the devil. He is real. Holy Mother Church strengthens the ones who give us this Word. This is a fight to the death against the devil and all those who follow him. The fight is above human strength, but Our Lord gives the Holy Ghost to men so they can fight. Our Lord told St. Peter that he is to testify that Our Lord is Almighty God – he is to give witness. The Apostles were shaken by this, but our Lord said ‘Do not fear! I will give you the Holy Ghost.’ The Church has always been in this spiritual fight against the devil and all those who spread errors. I say to the deacons, this word belongs to God and to the Church. Do not put yourself above the Church. Do not try to judge the Church. Remain a child of the Church. It is true that a lot of prelates and cardinals have not been faithful. But the Church is the Mystical Body. It is one body incorporated into Our Lord Jesus Christ. Not one grace can happen without the immediate intervention of Our Lord. Priests and deacons are just his instruments. In the Holy Eucharist, our Lord gave a means to multiply Himself. There is only one Jesus, one Body, one Soul. And in each host, He is completely, fully there. He multiplies Himself through the real presence. But He hides Himself. For our Lord Jesus Christ, His species is the priest, though the man that is the priest is still present. Our Lord is the priest and the victim. There is only one priest, Jesus. Only Jesus absolves in confession. At Mass, the priest opens his mouth and says, ‘This is My body,’ and it is Jesus speaking. These words do not belong to the man; they belong to Jesus. The only one who has the might in His words and to produce what He says is God. In Genesis, how did God create? By speaking. By His might He makes what He says a reality. This might is given to the priest when he gives the sacraments. When the priest speaks, the whole, infinite holiness of God comes through. 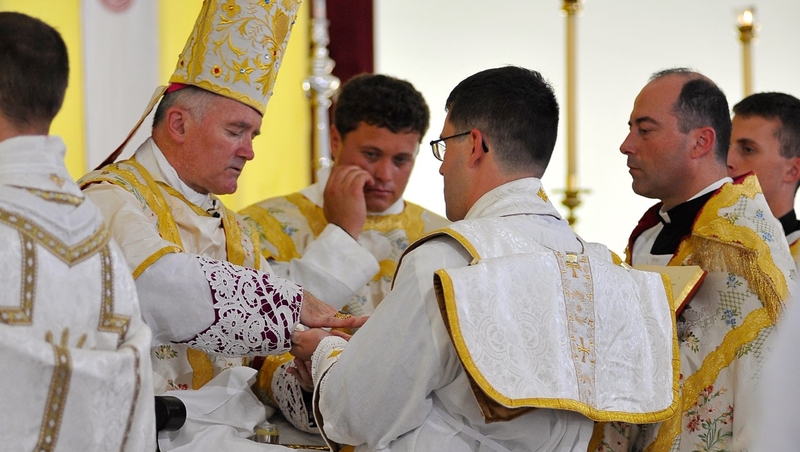 The priest’s hands are consecrated – they are dedicated to give blessings. It is beyond understanding what kind of treasures God has deposited to His priests. The priest himself is an incomprehensible sign of God’s love. St. John Vianney said that if we understood what a priest is, we would die of love. A priest is a mediator, a key, one that reunites God and man after they have been separated by sin. The priest repairs the damage caused by sin. When God chooses a priest, He chooses a victim. It is hard to understand. Our human nature does not like it. But a vocation is a call to be a sacrifice. 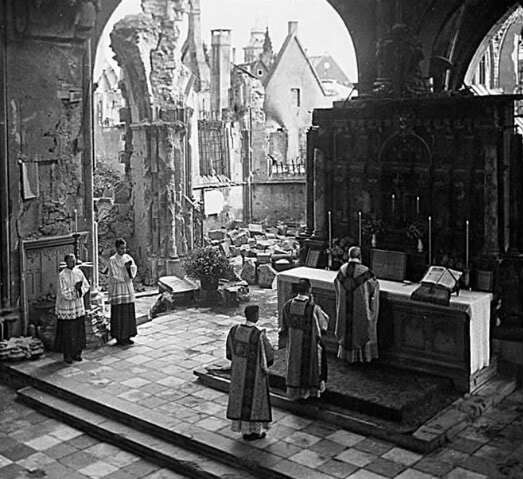 Every Mass is a sacred sign of an invisible sacrifice. In a Mass, our Lord Himself perpetuates the sacrifice of Calvary. This sacrifice is consummated with the Communion of the priest. The priest is obliged daily to make this sacrifice. In each sacrifice, we priests offer ourselves. 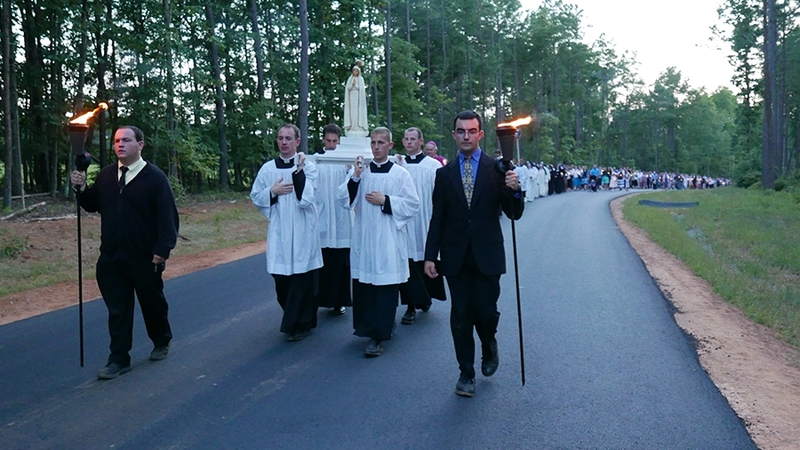 Each priest should say, ‘I am immolated with the sacrifice on the Cross. I am dead with Jesus.’ That is the priest that will cleanse sin from the world. To be a priest is something serious. Modern men want to get rid of sin; they have no sense of sin. They want to get rid of mortification and death. But Our Lady said souls will go to hell because no one makes sacrifices for them. A sacrifice hurts. Charity, which is love, is difficult to really understand. It is gentle and kind and good, yes. Those God loves the most – look at what He requests of them. Who does God love more than the Blessed Virgin Mary? And we know what God had planned for her. Today is the first Friday, the day of the Sacred Heart, which is a visible indication of God’s love. The Sacred Heart is opened by a lance to show us God’s love, and it is surrounded by thorns by our ingratitude. 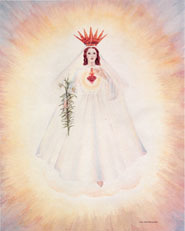 It is the same with the Immaculate Heart, which is crowned with roses and surrounded by thorns. The priest must be like these two hearts, and the fulfillment of this is his vocation. In the world, there is hatred of God, a meanness of creatures who are against their God. The priest must win over the evil by goodness. The priest reminds us of the love of God. He is the ambassador of God. When this goodness shines, it will touch hearts to continue God’s work of saving souls. This entry was posted in SSPX and tagged SSPX on July 11, 2017 by damselofthefaith. 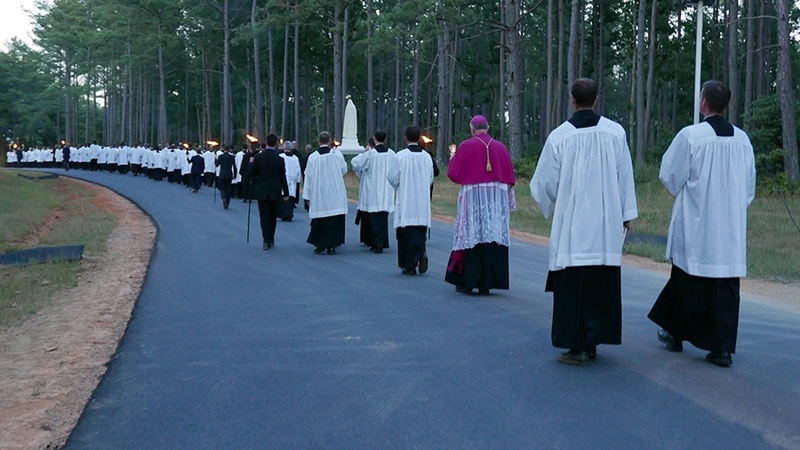 As a parting “gift” to the Society of St. Pius X, in a letter to Bishop Fellay, approved by Pope Francis, Cardinal Gerhard Muller, who we must recall rejects the doctrine of the Perpetual Virginity of the Blessed Virgin Mary, demands that the Society accept the teachings of Vatican II to be “accepted” into their new church. Once again, Rome flip flops on this issue, which they have been doing well since the Society was first founded. Is it any wonder that the Society does not accept a deal, such as a Personal Prelature, when Rome changes its position every other day in complete dishonesty? Let your yes mean yes and your no mean no, Christ said. Modernists, those posing as “conservative” or not, are hellbent on fashioning us into compromisers for their agenda. It is impossible to accept the heresies of Vatican II, a pastoral council we are not required to accept because it declared no new doctrine, and the legitimacy of the New Mass. They were unjust laws foisted upon the Church. They cannot be reconciled with the pre-counciliar Faith and therefore, they constitute a grave danger to the faithful. 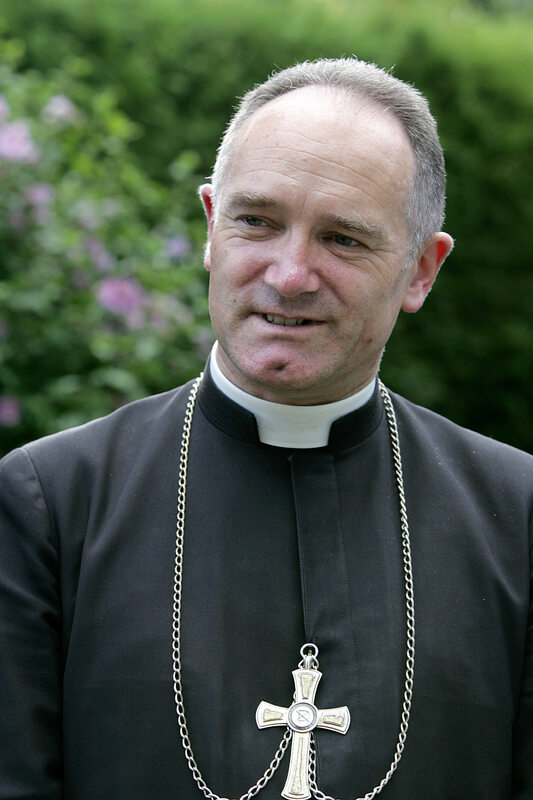 I only pray that Bishop Fellay continues to remain prudent and is not deceived by their cunning. God’s will be done. 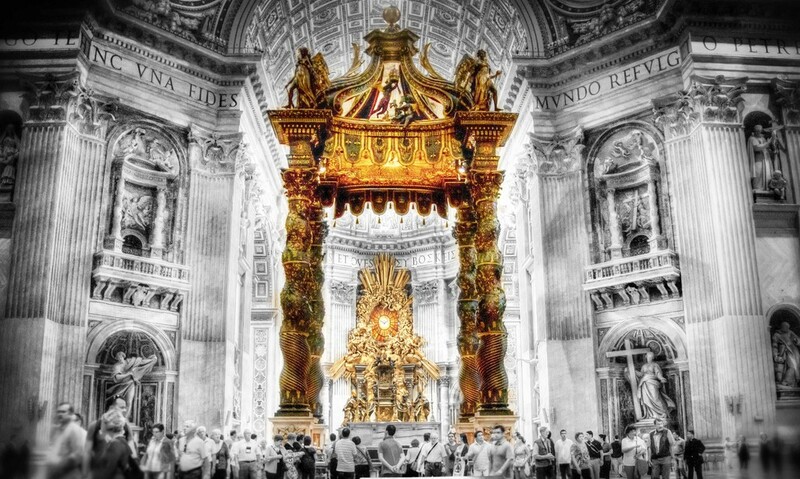 Anybody with eyes to see can see that the Society has been the foundation for the flourishing and restoration of Catholic Tradition in the Church. May we only continue to bear fruit for the good of the Church. From http://www.medias-presse.info comes the following excerpt of a letter from Cardinal Müller to Bishop Bernard Fellay. 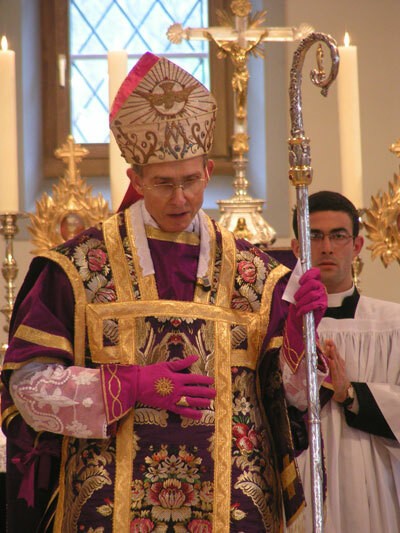 According to http://www.medias-presse.info, Cardinal Müller’s letter was communicated to all SSPX members by the SSPX General House. 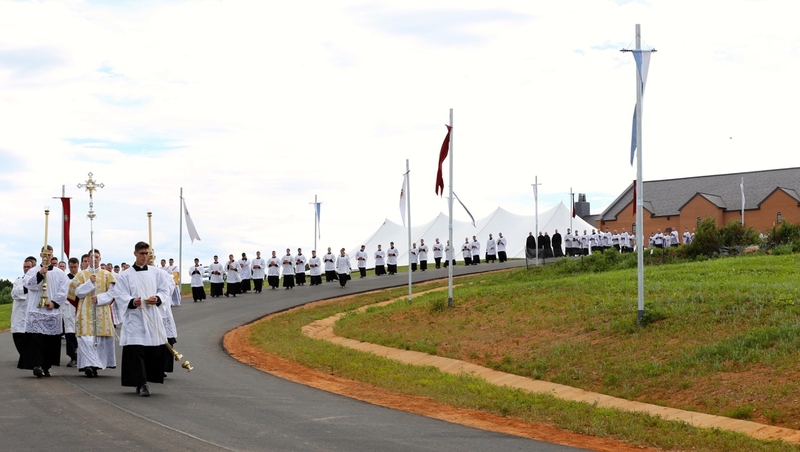 “As you know, Pope Francis has many a time manifested his benevolence towards your Priestly Society, granting, in particular, to all priest members the faculty of confessing the faithful validly and by authorizing local Ordinaries to grant licences for the celebration of the marriages of the faithful who follow the pastoral activity in your Society. Furthermore, discussions are continuing concerning questions relative to the full re-establishment of the communion of your Society with the Catholic Church. 1) It is necessary to require the adhesion of the members of the Priestly Society of Saint Pius X to the new formula of the Professio Fidei dating from 1988 (c.f. annexe). Consequently, it is not sufficient to ask them to express the Professio Fidei of 1962. 2) The new text of the doctrinal Declaration must contain a paragraph in which the signatories declare in an explicit manner their acceptance of the teachings of the Second Vatican Council and those of the post-conciliar period, by granting to said doctrinal affirmations the degree of adhesion which is due to them. “The Society of Saint Pius X does not seek primarily a canonical recognition, to which it has a right because it is Catholic. The solution is not simply juridical. It pertains to a doctrinal position which it is imperative to manifest […] Divine Providence will not abandon Its Church whose head is the Pope, Vicar of Jesus Christ. 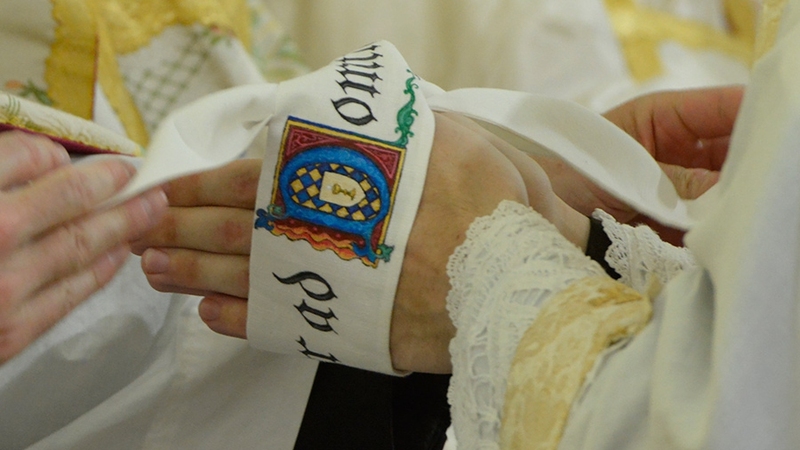 That is why an incontestable sign of this restoration will reside in the signified will of the Sovereign Pontiff to grant the means for re-establishing the order of the Priesthood, the Faith and Tradition – a sign which will be, furthermore, the guarantor of the necessary unity of the family of Tradition”. This entry was posted in Catholic, Church crisis and tagged Catholic, Crisis in the Church on July 7, 2017 by damselofthefaith.